Poppies add bright color to the garden. 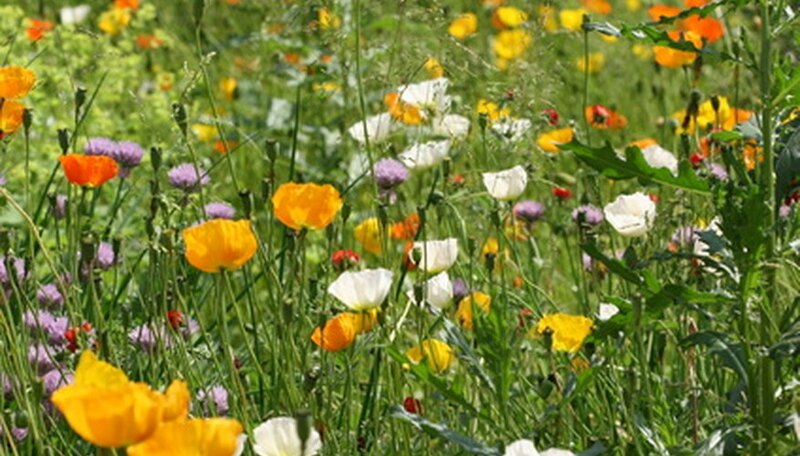 There are both annual and perennial poppies, with varieties available that suit almost any climate. Poppy seeds germinate easily and are often started indoors. You can also purchase seedlings from garden centers and nurseries. Mature poppies do not transplant well, as they grow a long taproot that is easily broken when the plants are moved. Transplant only young plants and seedlings so that they survive the process and are able to thrive in your garden. Set the poppies outside in an area protected from wind and direct sunlight one week before you intend to transplant them in the garden. This process is called hardening-off, and it prevents sunscald and wind damage once the plants are placed in the bed outdoors. Tear the rim off the pot if the poppies are in peat pots or other biodegradable containers. The rim wicks moisture away from the poppy's roots if it protrudes above the soil. Dig the planting hole to the same depth as the pot the poppy is in, using a trowel. Set the pot in the hole so the top of the pot is just beneath the soil surface. If poppies are in plastic pots, remove the plant from the pot first then set the poppy in the hole so that it's at the same depth in the bed that it was in the pot. Space the poppies 6 to 10 inches apart in all directions. Fill in around the poppy with soil. Lightly firm the soil around the plant with your hands. Water the bed after planting. Moisten the soil to a 6-inch depth to eliminate any air pockets in the soil around the roots. Plant poppies outdoors in spring after all frost danger has passed. Transplant poppies on an overcast day so they have time to adjust to the bed before being subjected to direct sunlight. Be careful not to break the roots of the poppies, as this will kill the plants. If the plants are stuck in a pot, soak the soil two hours before transplanting to help loosen them.